This bouquet clipping 50 mixed roses well-adjusted is a perfect epitome of your love and care. You can gift this bouquet to your loved ones. 50 mixed roses are wrapped in red paper packing and tied with a ribbon bow. Roses have the power to express those unsaid words. It’s a perfect bliss of happiness for every occasion. Be it, Birthday, valentine’s day, rose day, anniversary, success party, mother’s day, friendship day, propose day, wedding, father’s day, daughter’s day, farewell party, welcome party and many other occasion. 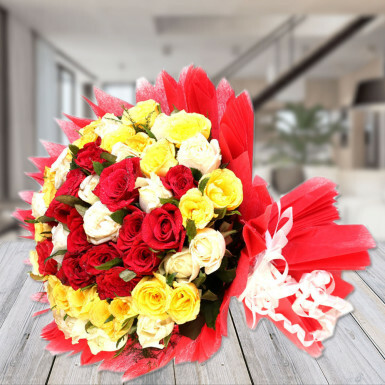 Multicolored roses have the capability to unfold the multiple feelings and this bouquet is perfect offering to express those feelings.